Automobile via the “Northway,” Interstate Highway 87. Ground transportation is available from the Albany, New York Airport, Amtrak Station and local bus stations. For information on schedules & rates, call The Sagamore Transporation Office at (518) 743-6015. Transportation arrangements should be made no later than 48 hours prior to arrival. 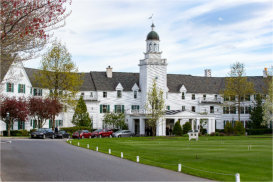 The Sagamore is a Four Diamond Resort which has been lovingly restored and updated. It combines all the comforts and activities you desire today with luxury and service reminiscent of the past. In an atmosphere that’s both peaceful and stimulating, you’ll enjoy fine dining, elegant accommodations and sports and recreation all situated on a private island on Lake George at Bolton Landing, New York. Room rates are per room per day. European Plan Rates (EP) includes accommodation only. There will be 7% NYS Sales Tax and 4% Warren County Occupancy Tax added to the rate, unless tax exempt status has been approved. Additionally, there is a Resort Fee of $15.00 per room, per day. A credit card is required to confirm your reservation. A non-refundable $35.00 processing fee will be charged at time of booking. The balance of the stay will be charged to the credit card fourteen (14) days prior to the arrival date. Should the reservation be canceled fourteen (14) days prior to arrival the $35.00 processing fee will be forfeited. If the cancellation is made fourteen (14) days or less from arrival, the total amount will be forfeited. In the event you do not arrive on your reservation arrival date, your reservation will be canceled and the total amount will be forfeited. The Sagamore extends their accommodations rates coming in two days prior and/or after the conference. Hotel registrations are done directly through the hotel, NOT with your conference registration.